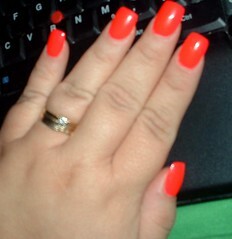 My nails, although they are actually pink, not orange. Originally the first pair was ordered as regular glasses but, came in as sunglasses. I still like them but, I need a pair of backup glasses so I’ll have to order another pair. The next pair are *the* pair of sunglasses. Big and silly, and just the absolute perfect glasses for me. You should order from them, too. And no I do not get a kickback from them.